Gingrich and Johnson also spoke out against holding many public hearings on oversight. Johnson said “A lot of communication with Congress doesn’t have to be in the hearing room.” He called for more work between the two branches to be done on an informal basis and said that hearings would work best at the end of the process. Anyone out there have a few things to say about the effective programs listed at http://www.expectmore.gov? Perhaps a Congressional oversight hearing is merited on the effectiveness of Expectmore.gov. For example, the Nuclear Regulatory Commission scores high marks in its spent fuel program, yet the program has done little since 9/11 to ensure that spent fue l pools are adequately protected from a terrorist attack (a scenario with the 9/11 Commission reported that terrorists had considered). Indeed, if the program is run so well, why did the NRC stone wall the Congressionally-requested National Academy of Sciences when it was conducting a review of security at the fuel pools? NRC refused to allow its report to be released but, even worse, it refused to provide information to the Academy to help it conduct its study. According to the study (pg. 33): “The Nuclear Regulatory Commission declined to provide detailed briefings to the committee on surveillance, security procedures, and security training at commercial nuclear power plants.” Luckily, the House National Security Subcommittee has held hearings to hold NRC accountable. Unfortunately, these “evaluation programs” by the executive branch often end up to be mealy-mouthed exercises in paper pushing. Though they can be useful, they cannot replace checks and balances between the branches of government. A principle, one which we feel folks like Johnson and Gingrich should be reminded, upon which our constitutional republic was founded. In 2003, POGO detailed how a contractor, Science & Engineering Associates (now Apogen Technologies), used its political connections in an attempt to retain a government contract. That contract administered a program compensating former nuclear weapons workers with illnesses that could be linked to exposure to toxic substances while employed at a DOE facility. Now run by the Department of Labor, the troubled program started under DOE's watch. [B]illings of employees in labor categories for which they were not qualified or that did not reflect the duties they actually performed, the inappropriate use of fully burdened labor rates for subcontracted labor, add-on charges to other direct costs and base fees that were not in accordance with contract terms, and various other direct costs that were improperly paid. The silver lining for sick workers is that the DOL is processing claims and paying claimants, albeit at a slow and questionable rate. The bad news for taxpayers is that the contracting problems identified by the GAO are similar to those with Iraq and Katrina contracts, and the government isn’t adequately protecting the $329 billion (pdf) it spends each year on goods and services. If you missed it, check out the CBS News article and video about workers who are struggling to get paid under the program. Even our U.S. Senators are questioning their priorities. Tuesday's proposed amendment to ban flag burning failed to catch fire (but obviously created a great opportunity for puns). Many Senators who supported the amendment admitted that it was not the most important issue facing the country. Adding prestige to this debate, Sen. Frank Lautenberg (D-N.J.) provided a poster of Kid Rock wearing the American flag (which was arguably disrespectful to Old Glory) and reminded the Senators that the musician performed for the Republican National Convention in 2004. “They partied with him, they loved him!” said Lautenberg. Many Democrats accused Republicans of prioritizing politics over legislative pertinence and bringing up the amendment to create a divisive issue for the 2006 congressional elections. Perhaps. Either way, the flag burning amendment has become an annual sideshow for members of Congress on both sides of the aisle. Bryan Bender of the Boston Globe is one of the best reporters on the Pentagon beat. His latest article takes a look at the rapid expansion of the relatively new Joint IED Defeat Organization (JIEDDO), where $6 billion has been spent to date, and criticism of it. Not surprisingly, an internal Pentagon report written by counter-insurgency specialists argued that the new bureaucracy has overly prioritized technical solutons at the expense of common-sensical, cheaper and more effective solutions, such as "preventing Iraqis from becoming part of the insurgency." Intelligence and short-term projects have been sidelined in favor of long-term expensive, Cold War style contractor-driven initiatives, say anonymous members of the task force which wrote the report. "The response to the IED has been primarily to increase force protection by emphasizing technical solutions which have proven insufficient," said the internal report. ``Business as usual will no longer suffice." The head deputy director of JIEDDO, Brigadier General Daniel Allyn, told the Globe that his organization was not too close to large defense contractors: "We reach out to a broad array of people. We are interested in the what -- not the who. We don't have favorites." However, one of those companies appears to may have been MZM Inc. (now Athena Innovative Solutions), whose former CEO, Mitchell Wade, has pled guilty to bribing disgraced Congressman Randy "Duke" Cunningham (R-CA). MZM was looking for "Counter IED Specialists" last year and Athena is continuing the search. Whether MZM was inappropriately awarded contracts for counter IED work with JIEDDO, or not, is unknown. The campaign ``is poorly focused," stated the Pentagon assessment prepared for Abizaid's command. ``A better strategy would focus on preventing Iraqis from becoming involved in the insurgency." It criticized the IED effort for failing to protect ordinary Iraqis from the homemade bombs and suicide car bombs. The Pentagon ``has given little attention to effects of IEDs on the [Iraqi Security Forces], the civilian population, and the Iraqi infrastructure," according to the assessment. ``Protecting the population is one of the key precepts of counterinsurgency." Some who work in the organization agree that it must look to means other than technology. ``You need to step back and look at the whole kill chain," said Starnes Walker , the chief scientist for the Office of Naval Research who was brought into the IED effort last year to help provide new thinking. ``That goes from the making of explosives to the packaging to the idea of distributing it, actually positioning it." He said the organization needs to continue funding physical sciences, but to devote more money and brainpower to ``human, behavioral, and cultural sciences as well." One participant told the Boston Globe that General Abizaid said, "Expensive Pentagon devices will not stop the bombings. Only people can stop the bombings." ...the Times appears to take some liberties. Jim Flyzik, the former Treasury Department chief information officer who worked for the Office of Homeland Security in the White House, is listed as working for the Flyzik Group and for Unisys. Flyzik told us, however, that he does not work for Unisys, nor is Unisys a client. “I am on a Security Leadership Institute that is ‘sponsored’ by Unisys,” he said. The Flyzik Group assists clients in gaining unique insights on government programs and understanding problems government agencies are attempting to solve. The Flyzik Group will work with client representatives to craft strategies and solutions to government business problems. Support could include attendance at meetings and strategic planning sessions, introducing clients to key decision makers, email and telephone exchanges, assistance on RFP and Proposal reviews and presentations to client staff members. The Flyzik Group has unique knowledge of key agency programs and key decision-makers. Mr. Flyzik may be acting perfectly ethically in his business dealings. However, his role in helping contractors access government officials certainly deserves scrutiny. The American public has the right to know whether Mr. Flyzik made contracting decisions during his tenure as a government official that benefited his future clients. Yet those kinds of records are not kept by the government. We focus on this only because the story seems to tar many people with the broad brush of unethical behavior without really stating what is unethical. If there is unethical behavior going on, it should be prosecuted. There are laws against it, and people have been tried and convicted. Safavian is only one example. In fact, the laws against unethical behavior concerning the revolving door and financial conflicts-of-interest are monumentally weak. For example, Darleen Druyun was involved in more than a dozen contracts involving billions of dollars going (potentially inappropriately) to Boeing Corporation before landing there as a highly paid executive running the company’s missile defense division. This was considered legal and ethical due to the fact that she was running a different division of the company than the one that benefited from her role in steering the government’s largess. She went to jail for knowingly violating conflict-of-interest statutes, but not for helping Boeing out. A Pentagon review last year found that the Druyun scenario could happen again. Similarly, David Safavian will not got to jail for trying to help a lobbyist (Jack Abramoff) who took him on a fancy golfing trip. He was caught lying to investigators. 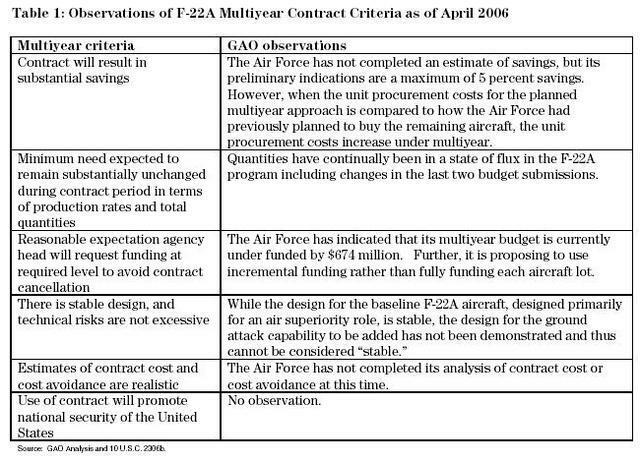 The F-22A program does not meet the criteria for multiyear procurement as laid out in 10 USC 2306b section (a)(1). The Senate will vote on whether to include the amendment today. They should vote "no" on multiyear procurement of the F-22A Raptor, one of America's most costly weapons program, because it will cost taxpayers more and does not meet the legal standards for such a procurement scheme. UPDATE: Tell your Senator to vote "nay" on Senator Chambliss' amendment. On the last criteria, whether the program will “promote the national security of the United States,” GAO offers the most devastating comment of the entire report, “No observation.” Put simply, given a chance to offer an assessment whether the F-22 – at any cost – would help protect America, GAO chose to pass. Ouch. This is a letter signed by the head of the GAO, David Walker. Of course, Lockheed feels a little differently than the GAO. One of its top lobbyists, Jack Overstreet, a former chief of weapons systems for the Air Force, has been pushing (pdf) hard for Senator Saxby Chambliss' (R-GA) MYP amendment (pdf). While some members of Congress are trying to cut pork out of the Congressional diet, other members are concerned about interest group spam (known to some as constituent e-mail). New web technology enables members of Congress to require the completion of a simple math or logic problem (examples include what is 5 minus 1, or 3 x 1) before constituents can e-mail them. The optional enhancement to "Write your Rep" is designed to thwart mass e-mails and ensure that only an actual person can complete the puzzle. In some cases, like Sen. John Cornyn's (R-TX) contact page, constituents are asked to choose the nth word out of both politically-charged or nonsensical words like xenophobic, snootiness, canonizing, secretions, skidooed, markups, and snafus. Common Cause described the new technology as "blocking communication from the people who vote [Congressional members] into office." The ACLU agreed and denounced the use of "logic puzzles." According to the Washington Post, of the 8,262 times the logic puzzle was viewed in the House, only 1,568 people solved the puzzle correctly and moved on to send a message, which could mean that the computer could not crack the code or humans were frustrated and gave up. The Post's Jeffrey Birnbaum (in what is arguably abusive hyperbole) compared the measure to poll taxes once used to prevent blacks from voting. Approximately 60 offices have already added the feature to their websites. That number may decrease: Rep. John Dingell (D-MI)'s office is reportedly taking it down, saying the technology does not fit the office's needs. Anyone with an e-mail account can sympathize with Congress members' desire to reduce spam. Unfortunately, the fundamental problem may be lawmakers' general resistance to constituent input in e-mail form. The new web feature also risks being challenged by the Americans with Disabilities Act. Many advocacy groups provide form letters (like this) through their websites that would be filtered out, if sent directly through the website. Whether a member of Congress considers the letter "spam" is beyond the point--constituents have the constitutional right "to petition the government for a redress of grievances." The jury found Safavian guilty of three counts of making false statements -- to the GSA Office of Inspector General, a GSA ethics official and the Senate Indian Affairs Committee -- and one count of obstructing the GSA inspector general's investigation. He was acquitted of another charge of obstructing an investigation by the Indian Affairs Committee. Safavian tried to help Abramoff acquire a General Service Administration properties, but didn't get very far. The seemingly endless number of corruption cases the public has seen in the last year from Duke Cunningham to William Jefferson casts serious doubt on the integrity of our government. Though most government employees do their jobs well, many must feel demoralized when the system allows corruption to grow rampant in their midst. New York Times’ Eric Lipton has an excellent article on line today about Department of Homeland Security officials who went on to “sell” their expertise to companies seeking hundreds of millions of dollars in Department contracts including Booz Allen Hamilton, Lockheed Martin, and General Electric. An ethics officer reminds us that all this “is permissible under the law,” and that it is unfair to “tar people” by questioning the ethics of their cashing in on their government service. Is it? There are plenty of jobs to be had that don’t involve making millions of dollars out of the American taxpayers' check book. The article helpfully points out that the U.S. Office of Government Ethics approved a request from “senior department officials” to split the department into seven components so that, “Once in the private sector, most former department officials were prohibited for one year from lobbying the same component where they once worked.” Even with underlings to do the lobbying for them, high level officials still could not wait a year before cashing in. Who would you rather have running your Department of Homeland Security? b) Someone who plans to stick around for the long haul of protecting the U.S. from its enemies and the threats it faces. The government is losing “billions of dollars” in oil and gas drilling fees, according to former Minerals Management Service (MMS) employee Kevin Gambrell, who will appear tonight on the PBS program NOW. Gambrell is one of several government and industry whistleblowers who have come forward in recent years to point out that MMS is turning a blind eye when oil and gas companies may be ripping off the government and Indians. HINOJOSA: How much do you think that the American taxpayer is losing from your understanding of what oil companies are not paying in terms of their royalties? GAMBRELL: I think the American taxpayers are losing billions of dollars. HINOJOSA: How did they do it? HINOJOSA: How easy is it for an oil or gas company to essentially underreport the royalties that are due? GAMBRELL: It's easy ... In the past it was much easier ... I had an example probably three years ago where an oil and gas company was producing oil and gas from a well site and they never reported anything to the federal government. And I found out through a transporter that transports oil and gas that they had been producing. There was no way to really know that they were paying correctly until we've got the third party verification. Last week, another whistleblower, former MMS auditor Bobby Maxwell reached a decisive point in his fraud litigation against Kerr-McGee when the court ruled that he had standing in the case. Maxwell’s case alleges Kerr-McGee shortchanged the government on $12 million in royalty underpayments. Now he simply needs to overcome a motion for summary judgment before the case can go to trial, according to his attorney. Like Gambrell, Maxwell was fired, and was concerned that MMS is failing to audit oil and gas companies to ensure the government is receiving its fair share of royalties. Documents shared with POGO recently showed that the MMS has indeed cut back on its auditing of companies, in fact, by almost in half. In case you missed it, industry whistleblowers have come forward as well. Jack Grynberg an oil industry tycoon has a massive fraud suit against oil and gas companies and estimates they may owe as much as $35 billion in gas royalty underpayments. National Public Radio did an excellent story on Grynberg a few weeks back.